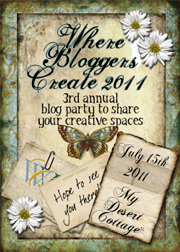 Where Bloggers Create July 15th 2011~ A Blessed Journey Through My Creative Space! Hello and Welcome Blog friends. So happy to have you visit once again for the 3rd annual party to visit Where Bloggers Create. This is my third time to participate and this year I have some changes and additions to share from my toile studio. Yes, I still have the toile and it still inspires me each day. You may remember from past WBC, the source for my studio design was from the talented and creative FiFi O'Neil who did her own studio in black toile and it was a feature in Romantic Country a few Springs ago. With the room rearranged to be more workable, I have a new area to design and write, finish paperwork and positioned to view my gorgeous roses right outside the studio windows. To be organized is very important to me and I seem to work better when I am not in the middle of a mess as to where supplies are. I have heard it said, this goes against the grain of an artist, but I'm one who just has to have my supplies straight and organized to move forward. That doesn't mean this space is neat all the time. Just the opposite, in fact, it gets messy and upside down as can be, most of the time. Yes, it is a real working studio with paint brushes galore, water bins, paper towels about and on some days, lots of confusion! But, I love every minute of it, clean up and start all over again. Finding different and unique ways for storage is always something I am on the lookout for and a few months ago I found a hanging jewelry bag which is perfect for bits and pieces to create with on each side. Another storage cabinet is fashioned from an old floor standing jewelry box with paint holders and vintage style jelly cabinet. Big old mayo jars hold lots of trims, easily visible. I call this treasure my "House of Paints" which is a house shaped shadow box my father made for me about 20 years ago. It holds nearly 200 bottles of paint, easy to see and handy. On the back wall, I have cabinets which also hold tons of stuff and above those cabinets even more stuff in coordinating file boxes. You see, I have lots of stuff to create with, but it's all organized stuff. You get my stuff? LOL~~ LOL! Before this room was my studio, it was a third car garage, converted, so the bank of cabinets covers the sealed garage door. Except for the garage door runners, you would never realize it was a third car garage converted. It really never held a vehicle for I claimed this space when we first moved in this home nearly 16 years ago. Vintage large pink lazy susan holds many paint brushes ready to swing ~~ all placed in my love for Lucy mugs. The Paris cup holds my favorite brushes ready to create with! My sweet Miss Beazy Lee wants to say hello. She is waiting for her little window lizard friend to visit her today. I hope he comes to say hello. It is very HOT here in Texas. ~~One of my favorite quotes was said by my father many years ago. He said, "Find what you love to do, and you will never work another day of your life"So I hand painted this quote above the wall of windows here in my studio. I see it daily as I create, remembering, doing what one truly loves is a joy and pleasure, a blessing and gift from God. It hardly seems like work. The quote continues across the wall above the windows and chandy. Paint shirts hang from a vintage coat stand and of course, a Texas studio must have a pink Cowgirl Hat with a Crown! and the crown lights up too! This special place to create is full of art and music, keepsakes stored in pink rose cases and a Dream board for holding momentos. Yes, this girlie girl loves La Job! Of course with any business, there has to be a place for the computer work, tending the shoppe and blogging. So my desk area and office machines fill a wall by the door with under and over cabinet storage for paperwork and supplies. Now moving on, I'll take you to a few more areas that have become additions to my creative space with much needed room to grow. We leave this room, past my store room that holds many treasures waiting for a redesign. A storage room where my treasures found on junkin trips will live before they reach my creative space. As we walk past the store room, we will also pass by my little shipping department. The place my creations stop before they leave for another home. And, before pretties get wrapped and shipped, the newest treasures will line the shelves in my etsy shoppe right here. I call this "La Cottage Closet" full of hand painted and created treasures for the home and gift giving. Our last stop takes us to my newest area for creating. I think of this as my extension to my studio being just a few steps away from where I paint. It is for sewing, creating, planning and also holding lots of storage in unique ways. I am just beginning to put this space to the best use as I add new designs to my line in the coming year. I love this old vintage printer box to hold thimbles, next to a gorgeous toile paper doll made by my friend and blogger, the talented Marie Antoinette. Shelves full of supplies, inspirational books and design board with handy tools easy to reach. The toile pillow bed under the work table is for Miss Beazy. Of course she has to have a designer bed, right?! More storage drawers underneath the work table with toile panels, which I created to neaten the clutter. A new and useful much needed sink my Best Guy built. It is wonderful to clean paint brushes and make tea stained lace and has lots more storage underneath. A romantic and French inspired area for storage with pull down ironing board and corner cabinet to hold decorative treasures. Altered art glass canisters and more collector thimbles. Some I collected and others I hand painted all live here. The sign above reads "Our Family is BLESSED by the grace of God"
We've come to the end of my creative space party tour and Where this Blogger Creates. I so enjoyed having you visit to share in a bit of my world. Before I get back to some designing, I invite you to visit Karen our awesome hostess, at My Desert Cottage where she has the list of participants this year on her right sidebar. Many bloggers have shared their studios and creative spaces. It will probably take the rest of the summer to visit everyone. How fun it will be to see the special places used to create. Thank you Karen for all you do to make this day so special for all those sharing their creative space. And, I want to say a special thank you to my wonderful husband and son for all the support you give me in my artful and creative journey. Because God blessed you, you have blessed me to enjoy a journey that is my pure joy. Also, a big thanksgiving to my many wonderful customers throughout the years. You have encouraged, inspired and brought me more joy then you will ever know. You have truly blessed me and given me wings to soar. Until we meet again, I'll be creating, painting, designing, filling the shelves of my rose inspired shoppe and having fun not working. "Find what you love to do, and you will never work another day or your life" Thank You Dad! You know I adore your creative space...and we are such kindred spirits. I too can be quite messy when in the midst of my creating..but order and keeping it clean and starting over in a fresh room is also part of who I am too. I can see so many new and amazing pretties too! Thanks for sharing your room with us. Oh! Too wonderful for words! A dream of creative space! Inspiration and then some! Thanks for sharing, Celestine! Hi friend - OMG your studio is super! It is SO you! I love the black and white...and all the toile. Gosh and you have such a large space - so jealous. Hope all is well and BTW - you look marvelous - can I ask where you got the frames around your photos - love the look. Beautiful! I love the little changes you made and am so glad you kept the toile - I love it! The quote by your Dad is so appropriate and I love that you painted it on your walls. You have a beautiful space Celestina, which is no surprise - all your creative endeavors are beautiful. Thank you so much for the tour! Your studio,shipping area, and sewing area are all so beautiful! I love your little paint house. That is such a good idea! Thank you for sharing! What a wonderful work area you have, girl! It's a dream to have that much space to call your own to create your fabulous work! It is so well organized and has everything you could want. Love the sewing area. Haven't seen that before. To have the extra sink is a blessing in itself. I hate having to wash out paint in the house sinks. We are blessed with so much and I know and sense your thankfulness in all that God had done for you! Have a great weekend and stay cool! Absolutely love it! Thanks for the tour. You have always been an inspiration to me to keep going on my art journey. Thank you! OMG, this is totally amazing!!! Those black cabinets, the toile, the cabinet that your dad made, the dress form--it's all so, so beautiful!!! One more thing--Your precious dog is just sooo adorable!!! You have a gorgeous creative space! So many beautiful things to see and everything displayed so beautifully! Hey there fellow Dearbornite! Love your space - your are so organized and have created such a beautiful environment in which to create. space I loved how organized it is. Sweet friend...your space is simply amazing. You have been blessed with talent from God above and it shows in all you do. I love organization. I can't function without it. I love how everything in your studio has a place. Beautiful. Thank you for visiting me, another painter. You've blessed me so much. What a lovely space. Organization is key for me and you definitely have that going on. You do have quite a place to create and what resources to draw from! Of course you already accumulated in this house for 16 years, it took shape over the years. Love your Daddy's 'House of Paints' so practical and looking very neat and special. The same for his saying, that is so true. Lots of love and thanks for letting us in! It is a gorgeous space and the color is perfect in my book!! What can I say, but I have died and gone to heaven. I just love your room and the black toile is so pretty. Love the toile! It is such a stunning look. I don't do black and white very well- I need color in my world, but I must say it is so pleasant to see, especially with all the fun ways you have worked into your room. I am amazed and impressed with all the space and organization. I, too, must have order when I am creating. This is why I need my daughter, close by, to put everything back in order after working on a project. I'm excited to see your etsy shop, too. Happy creating, and blogging. I love your black and white. You inspire me in so many ways. You are so organized and neat. I love the way you have your things neatly tucked away and ready at the touch of a finger. Isn't black a great color??!! What a great room and it makes me want to come over and create with you. I have some vintage Easter toile paper you would love. Thanx for stopping by my place. The house of paints is AWESOME! I hope you'll have time to visit my creative spaces! Thump, thump, thump... That's the sound of my heart pounding as I viewed your photos!!! I love your space! Thank you so much for joining the party and sharing it with us. The party would not have been the same without you!! I love the toile! It's one of my favorite looks of all time and one that never goes out of style. Your studio is very beautiful. I could look at all of the pictures for hours! Wow! I so love your studio. I visited your space last year and was awed by everything. And, guess what? I still am!! I have to get some large mayo jars to hold some of my stuff. I have a ton of stuff that I need to purchase stuff to organize my stuff--LOL! Thanks for stopping by my blog and leaving a wonderful comment. I'll be coming back to really look at the photos for inspiration. thanks for sharing! Celestina, black and white is so striking and here in your work room it really stands out. Your room is absolutely heavenly, it must of taken you a long time to get everything so perfect, I love it dear friend. I love everything about your beautiful space (or spaces)! The quote from your father is so very true and it certainly seems as if it's a reality in your life! I will be back to visit again. I want to click and each photo and examine every detail!! Oh, my golly, Celeste. How could I expect anything other than exquisite beauty & detail where you work in your studio. I looked & re-looked to pick out a favorite. Can't do it Celeste ... it is all over the moon gorgeous. So depicts you, your heart & blessed talent. Miss Beazy is too durn cute, & what a bed she has in her boudoir. Have a beautiful weekend. Thank you for a peek into your studio. Your space all done in black and white is so elegant, I like it a lot! Such a wonderful place to create! I love it and so organized! Thanks for sharing and thanks for stopping by to visit my space. By the looks of your creative space it sure does look like you have found what you love to do!! Oh, i do love toile! You've created a wonderful studio and it was such a pleasure to visit! Thank you so much for your sweet comments when you visited my studio! I just drooled when I saw all of this black and white toile! My bedroom is done in this style, yes, with lot of black and white toile too! Hmmmm, kindred spirits?! All I can say is..WOW! I am in awe! I know I saw your creative place before, but I am totally amazed as how much you have and how organized you are! I miss Texas and the fun we had for those few hours, at Fr. Mike's anniversary. Lovely blog and workspace, so glad Cindy sent me over. Neat, tidy, organized and colour coordinated. I think I would be in heaven to have a studio like yours Celestina Marie. Thanks for sharing your awesome place. Thank you for sharing all of this with the rest of us, I so enjoyed my tour of your space!! Let me begin with I love the quote from your father! Your space is without a doubt the most beautiful one I have seen. You have all the right elements for creativity; toile, toile, and more toile, with some roses just outside your window! I love the house shaped cabinet which holds all your bottles of paint; such a great idea! Love the pillows and curtains and toile fabrics everywhere. Goodness, I could go in there and never leave. Thank you for sharing your gorgeous space. No wonder your creations are so fabulous! A gorgeous space for a gorgeous and creative lady! Have a lovely weekend, my friend. love your space, it's so elegant! What an amzaing studio you have to create in. I love the black and white and the way it makes other colors just pop - wonderful! I loved your studio the first time I saw it especially the black and white toile. I especially like all the little personal touches you added. One of the best I have seen. Happy Painting, girl. I'm back! I'm retired again and enjoying life on Golden Pond and doing a bit of traveling here and there. What a wonderful time I had with our sweet Marie!! I'm leaving for the Outer Banks this Friday to soak my toes in the Atlantic beach and see some lighthouses and eat sea food - going with Chrissy & a dear friend of our family. Your studio is the absolute best I've ever seen. You've done even more to it since I've had the privilege of seeing it in person! And the sewing room... FABULOUS!! You know how to put a room together and get the most out of it. The post on your Dad was so touching. Loved the photos. My Dad was a dear man also, I just had a good cry the other day about still missing him after 40 years being gone. Hi Celestina Marie, your studio is divine....such a lovely space. I really like all the black and white...it puts such definition on all the other things. Just gorgeous and soooo organized. Hi Celestina Marie, your studio is so classy looking and organized. Totally amazing! I just got home from the dog show and had to check out WBC photos. I love the quote your dad says... very true! I have a full time job that I love and my hobbies make life sweet! Hope you have a blessed Sunday! Stopping by to say Hello! Your studio is so inviting and creative. How great is having the new sink! No wonder such beautiful creations come from this awesome studio! I forgot to tell you I love Miss Beazy's designer bed at your feet. Thats right where my dogs like to lay and keep my feet warm while I paint. Love it! So calm and relaxing. Painting and our dogs at our feet, its the best therapy right?!! Thanks so much for leaving sweet comments on my blog post. I appreciate it more than you know! What a great tour! Love the black toile. If my husband would let me, I would toile the whole house! It looks like you collect thimbles from travel destinations. I do too! Thanks for the tour and for visiting my blog as well. I hope you will come back again. It was wonderful to be able to come and visit you and take the tour of your gorgeous work space and studio. No wonder you are so happy working here, everything is beautiful. I love the quote from your dear Father and it is so true. I enjoyed visiting your wonderful space. There is so much to see and I love the toile. I have thought of using blue and white toile in my space. You have so many different parts of your space and you manage to keep it all so organized. Thanks so much for taking the time to share with all of us. It's wonderful to visit your creative space again. So beautiful and organized. I love the color combination and your toile fabric; very French indeed. Your artwork is absolutely gorgeous. Thank you for the tour and sharing your beautiful space. Love Love love your spaces from the paint house to the I love Lucy mugs and all that wonderful toile. Such a talented lady! TFS!!!! Thanks for sharing your delightful "toile" studio. What a wonderful place to spend time. Hi Celeste! I always enjoy viewing your pretty work space! You really have it so well organized ~ I can visualize you crafting away there! Fun to see Miss Beazy, too. Give her puppy hugs and kisses from me and Sis and Rosie! I will email you soon! I LOVE your space, Celestina Marie! I do remember visiting last year and what a joy to come across your black and white room again. I am so copying you when I get an actual room to use! I have tried to do what I can with what I've got and I have incorporated my black and white where I can. I want to pick out specific things to tell you how much I like them, but really, I'm finding that difficult to do, because I do love it all! The first thing I noticed was that house of paint! LOVE IT! Your studio is gorgeous and very organized. Those are some big mayo jars indeed. :) What a rockin' pink cowgirl hat!! Thanks for the La-boratory love. So many beautiful and unique items, it's hard to pick a favorite. I love your organized work space. I have to share mine with Chip and he's a "little" messy. Beautiful and so well organized and thought out. I love your toile, repurposed jewelry armoire, little house of paint, and of course the roses you paint! What a lovely creative space, and so well organised! What a beautiful creative space. Loved looking at everything. Love love love all the black and white! So hard to believe this was ever a garage space. It is awesome. Love the house of paints, and all of your clever storage ideas. This is simply dreamy. I'm still visiting the lovely participants from Karen's Where Bloggers Create party and I just keep getting more and more inspired. Your space is beautiful. I know I would never leave. LOVE the black and white, one of my favorite combinations of all time. Thank you for inspiring. Absolutely Wonderful! Loved everything in all your rooms! The toile is simply gorgeous. All your storage ideas are so clever. I love the large Victorian lady by the thimble shelf, did you make her? Love the thimbles, too. Really enjoyed the tour! What an absolutely gorgeous job you have done with ALL of your spaces! Just amazing! I would be afraid to create because it is already 'created'!!! Thanks so much for sharing and explaining the various areas. It gives me lots of inspiration to tidy up and create my own! Best of all is your gorgeous little fur baby - I had a great girl like yours - now in Rainbow Heaven. Wow! You are organized! I love your Lucy mugs collection. Such fun! I agree, kindness does count. Thank you for sharing your beautiful space. Really nice space, I like how you kept it all in same tones through out the decor (black and white), lots of neat storage ideas. Aww...what a beautiful world you have going out there! Everything is just lovely! And quite organized too! Awesome studio. You have wonderful place to create, I love the black and white!!! From one Texas girl to another thank you for sharing!!! Hopefully you get a chance to stop by my craft cottage!! You are such an inspiration. I absolutely love your Creative Space and your sweetness of sharing it with all of us. It gives those of us that don't quite have that kind of space inspiration to create it for ourselves and to claim it. You brought tears to my eyes when I read about your Dad's Phrase. My Dad passed away in 2003 and even though it has been almost 8 years it sometimes feels like just yesterday. He was a Paving Contractor who owned his own business and he so loved what he did. Your Dad's Phrase would have so applied to him. I have come across a phase that I think I will put up in my Space and it goes like this "Begin as You Mean to Continue". And I so do believe that you have truly followed this. All the best to you from a Canadian that loves your style.